I've got a whole bunch of paper money, currency banknotes from around the world. I accumulated many of these from when I used to publish worldwide magazines. I accepted all currencies but there were lots that the British banks wouldn't accept. I've many from places like Iran and Iraq - some brand new with Saddam Hussein on the front. Well, new at the time I received them as this was pre-Bush and Blair. Amongst the collection I was rummaging through a couple of days ago was one from Cornwall - yes, Cornwall in England! 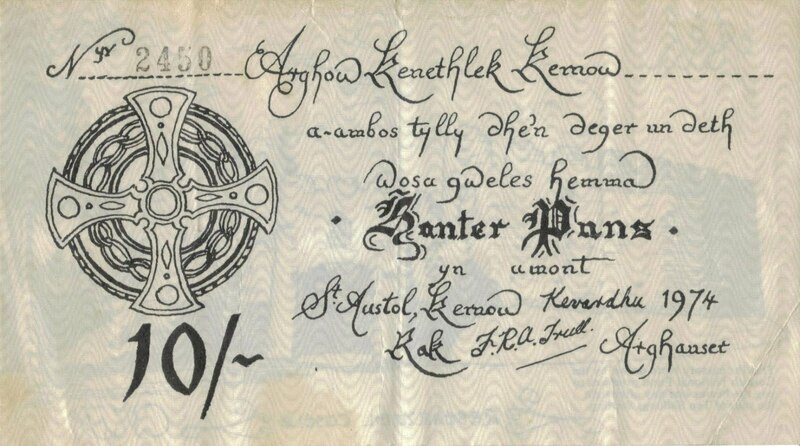 The following day, by coincidence, I got talking to someone locally and they asked if I remembered the time when a group in Cornwall tried circulating their own Cornish banknotes. "Not only do I remember," I answered, "I have one from 1974." 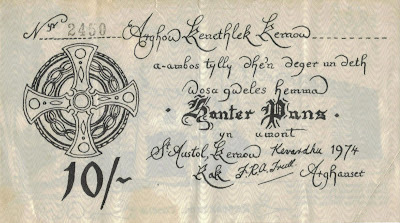 This Cornish currency was issued by the Cornish Stannary Parliament under the name of the Cornish National Fund. 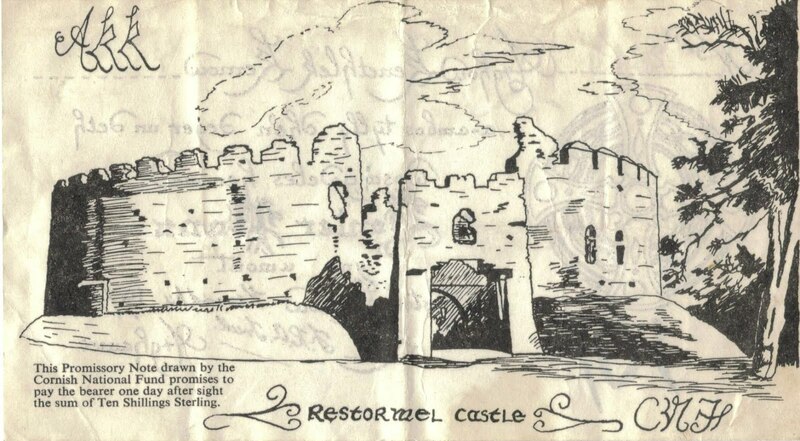 I won't go into the full details of the Cornish Stannary Parliament (CSP) but there is a section of the Cornish people who campaign for the restitution of Cornwall's legal right to govern itself, and do not recognise the British Parliament at Westminster, London. The reasons are quite complicated but fuller details can be seen on the CSP website. The general opinion is that Cornwall is a county of Britain and not a separate country or region. The self styled Clerk to the Stannary at the time of these banknotes was a man called Frederick Trull. However, in 1975 Trull attempted to 'arrest' court officials at St.Austell's Magistrate's Court when he was being tried for a motoring offence. He produced twenty-five pages of documents to try and prove that the court had no jurisdiction over him in Cornwall. He obviously lost the case and was found guilty of using threatening words and behaviour with intent to breach the peace. As Trull's signature (see on banknote above) was on the Cornish banknotes issued in 1974 they were all burnt - but I still have one copy - number 2450! Strange, but you never know when whatever you have been looking at will pop up in conversation a short while later. Coincidence or Synchronicity or Chance? P.S. While on the subject of currencies the Euro has had it's problems and there have been suggestions that it could collapse and countries would have to revert to their original currencies: Francs, Guilders, Marks, Lire and so on. 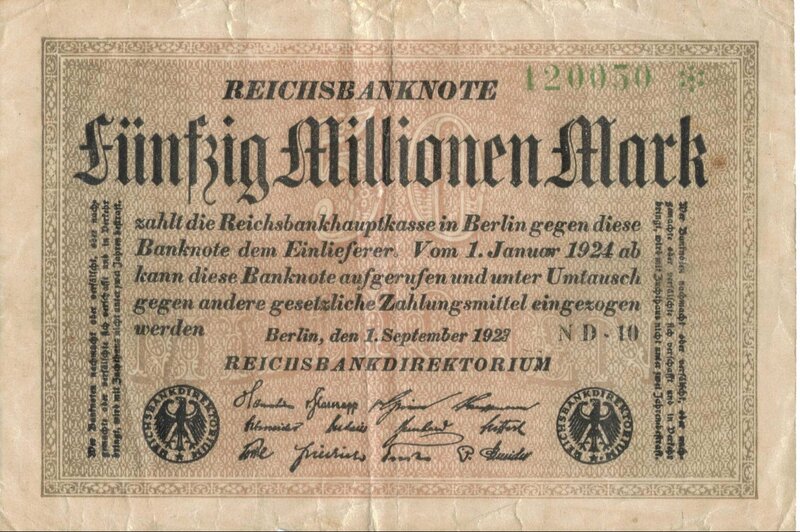 Interesting, as I have a German 50 Million Mark banknote! Think the German's would honour this, if the Euro did collapse? After all it is genuine!! Awesome. This post suggests a difference between currency and wealth. Then there's this "breach the peace" concept followed by the economic divergence potential if unified currency fails. The cash in the hand is always different from the abundance it represents. I love all the duality and innuendos in this post. Fun! Thanks Terri. You are very perceptive! Five minutes before I start work so good to read your blog before the onslaught. Love anything to do with Cornwall, didn't realise they had their own currency once. Did it catch on? The 1974 notes were accepted in a few local shops but then fizzled out. It was an unrealistic idea. With 50 million I reckon there would be drinks all round - at least! If money talks I'd like to meet the German in your life! The German in my life is my wife! She was born there but is now British. 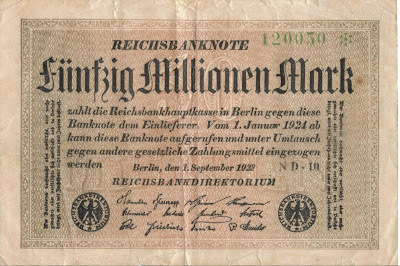 i happen to have one of these 50 million bank note from germany is it really worth 50 million?